Ken Okada is a Japanese fashion designer, graduated from the well-known Bunka Fashion College in Tokyo, just as Kenzo and Yohji Yamamoto. 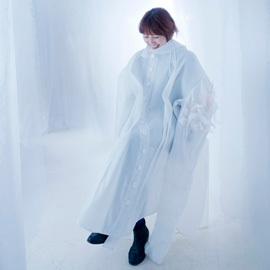 In 2001, she set up in Paris and launched her own women’s ready-to-wear brand, under her own name, Ken OKADA. She opened her first store in the famous area « Saint Germain des Prés » in 2005. In the meanwhile, she sent her collections, amongst others, at Takashimaya NY, the Galeries Lafayette Haussmann, and in the international (Milan, New York, Koweit, Melbourne, Berlin, Tokyo...). 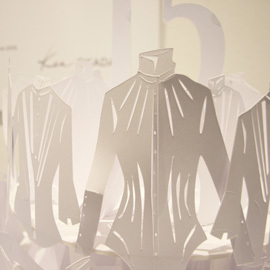 In 2009, the exhibition “L’histoire de la chemise Ken OKADA” at the Galeries Lafayettes Haussmann made Ken OKADA famous for being a reference as regards modern shirt. The following years, the designer is once again chosen to create, on the one hand, the uniforms for the Galeries Lafayette’s catering staff, and on the other hand, the costumes for the Paris Opera dancers. As the designer is fond of contemporary art, Ken OKADA launched in 2011 the innovative and unique concept, “Mod’Art”, binding Fashion to Art; painters, musicians, actors or photographers contributed to capsule collections with their own way, featuring fashion shows and exhibitions in the brand show-room dedicated to dreams and softness. Research and originality lead each Ken OKADA design and that makes the difference. The subtle union between the uncluttered Japanese style and the Parisian elegance match throughout a game of contrasts and transparency, underlining the sensuality and feminine nature. 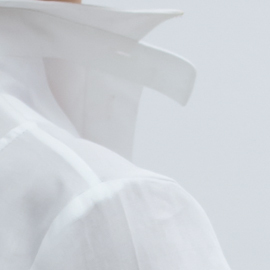 In 2014, the brand is kind of returning to its roots, and the designer decided to make a full collection - not only with shirts – and with men’s shirts, which achieve great success. 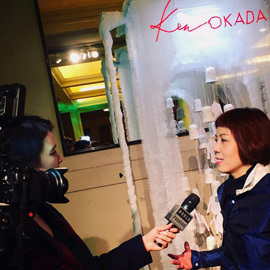 After celebrating the brand’s 15th birthday, Ken OKADA took an important step by participating at a huge event, the 20th edition of the “Designers’ Christmas Tree”, along the side of very famous designers. The well-known designers Jean-Paul Gaultier, Chantal Thomass and Jean-Claude Jitrois figured among the event’s participants. At the beginning of April 2016, Ken OKADA presented her Fall Winter 2016/2017 collection at the jeweller Lorenz Bäumer store, located Place Vendôme in Paris. What are the influences that Japanese culture brings to your work? Japan is first of all my training, especially the Bunka Fashion College which I came from. Today, I would say that it's a certain sense of the garment cutting. A form of modernity, close to the avant-garde. And everyday, a sense of service, precision of well done work and efficiency. That too, I think, comes to me from Japan. 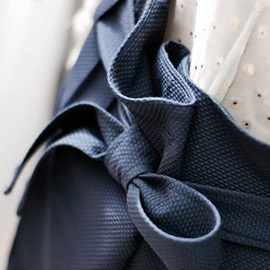 Your creations blend elegance with modernity. For what kind of customers are they? I call her "the Ken Okada woman". She is elegant, refined, cultivated, she has taste. She is also very active, assuming her personal life as well as her professional life, with its contradictions. She wants to be different and express her personality.